This FANTASTIC couple got married in January in Greensboro. Their families and friends were so graceful and polished, just like the couple. All of them had a ton of fun on the dance floor and in the photo booth! We had a lot of fun planning & designing their wedding and on the day of I was truly sorry for it to be over! My first choice is to always hire a florist. We have a few REALLY AWESOME ones in the Triad area, if you need a referral give us a call! 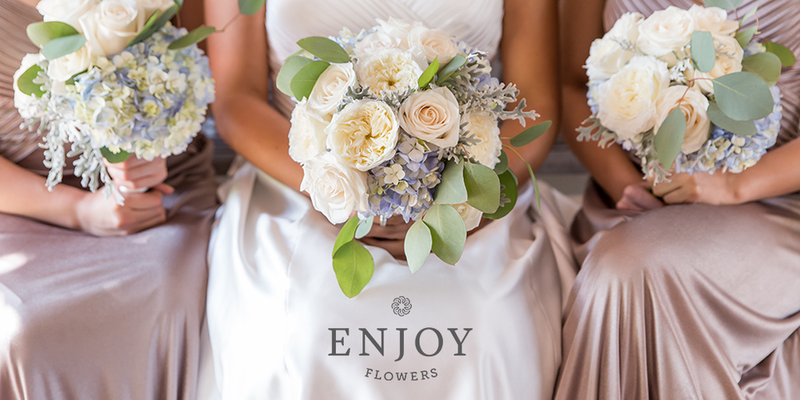 BUT we know there are weddings that may not warrant a florist and so we’ve teamed up with this fantstic new company out of Florida called Enjoy Flowers. They are not a wholseflower shipper, they are a flower grower that also is a florist and creates arrangements for you! Check out their website and some photos below! Don’t see something you like? 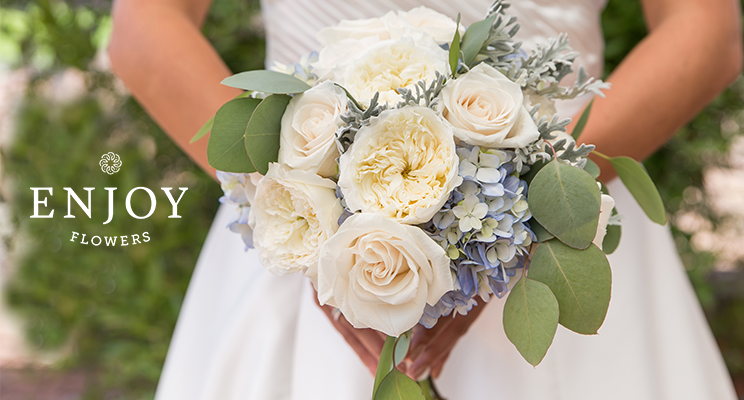 Contact us and we’ll help you work with them to create something that suits your wedding! Have a wonderful safe, warm and loving holiday! Don’t run out and start hunting for venue’s or your dress! There is no rush I promise if your love is true you’ll have enough time to do the most important thing first. Yes, I know its terrible to have to go through those numbers when you don’t know what things cost, but guess what? That is not what a wedding budget is! A budget is what you can afford for your wedding day. I know I’ve written quite a few posts trying to explain this but it seems every year about now someone gets themselves in a financial bind just because of skipping or misunderstanding this step. How do you find out what your wedding budget is? How much can you afford to spend each month? Look at it as a bill, can you finace $500 a month $1000 or more? Do you have other family contributing to the wedding? Take all of this into consideration and have the conversations with your family this way everyone is on the same page and you won’t get into a bind later down the line. What is the second most important step? Yes, this is an important line item in your budget and I’m going to tell you why. A wedding planner does everyday what you cannot comprehend. She is the one that will find the venue for your wedding - within your budget, your photographer - within your budget, and so on. Not only that she is going to elimiate a bunch of steps that you have to take on if you do your wedding on your own so all you have to concentrate on is attire. Those lists that you see online don’t do weddings justice. We once had 32 paid professionals all setting up at once for a wedding. I do understand that not all weddings are that intricate but they all mean something special to someone so why not take the extra step in guaranteeing that it is all that you ever belived that it would be? Before you run out and find a venue please PLEASE consider finding a great wedding planner first, but if you don’t… here are some really great tips on finding the right venue for you. Create your budget. This is what you can afford to spend on your wedding. Once you have it broken down into segments move to step 2. Use the internet. Google venue’s in your area and start calling for prices (if they don’t have them listed). Don’t go and see the ones that don’t fit in your budget. If you have a small budget then look at city/government owned venues, they are much cheaper. Also think out of the box, empty store fronts could be awesome for a reception. Also look into the church that you attend for your ceremony. Once you have a list of venues that fit in your budget try to visit all of them in one day. This way it is easy to rule out the ones that you don’t like or the ones that added on cost vs. your call or their website. As you visit ASK Questions, what is included, how many tables and chairs do you have and in what sizes? Make sure you walk out of there with a copy of their contract (for details) and their package information. Once you’ve visited all of them sit down with your spouse to be and go through and list out the pros and cons of each one. Once you’ve decided - book it! A disclaimer - wedding planners help you create your budget, they elimiate the #2 and hand you the list for #3. Most even have the answers that you need for #4. Having a wedding planner with you can not only save you time and energy they can save you money!